In the midst of the Twitter argument, Tony Haile, CEO of Chartbeat, which measures real-time traffic for sites like Upworthy, dropped a bomb: “We’ve found effectively no correlation between social shares and people actually reading,” he wrote. If you work in media, or have a blog, or are the sort of person who pays any attention to things like how many tweets an article has, this statement probably comes as a surprise. There is an implied relationship between the number of people who choose to blast a link to a piece of content and the interestingness of that content. The media industry has fully digested the idea that likes and retweets are marks of merit and that the viral effect of social media is the ultimate affirmation of relevance, which is why every major news organization now has at least one social media editor. To suddenly say that a story is just as likely to have been read by a million people and tweeted by none of them, as it is to have been tweeted a million times and yet never read, seems impossible. And yet, that’s what Chartbeat has found. There are a number of possible explanations. Clicks from social media are more likely to come from mobile devices, where readers typically spend less time on the page. It also likely reflects readers’ preferences about what types of links they click ‘ studies show people are more likely to share stories that are happy or nostalgic than they are to tweet about crime, for example. It’s also possible that some highly retweeted stories contain all the information necessary in the headline without the need to click on the article, as with some breaking news. Or it could just be that we’re in the age of the skim, as Slate’s Farhad Manjoo wrote last year, and people just don’t read things deeply on the internet. Are we sharing stories without reading them? So if you see someone tweet an article, it likely means they either didn’t really read it, or they read every word. That makes it tough to judge a story by how many tweets it has. But new insights into how many people tweet and click versus how many actually read are actually prompting a change in the way publishers market themselves to advertisers. Upworthy, YouTube, and other platforms have started paying less attention to page views and more attention to how engaged people actually are. Upworthy has started tracking a new metric called “attention minutes,” which measures the total amount of time that people spend actively paying attention to the site, along with the amount of attention paid to each piece. How does it work? 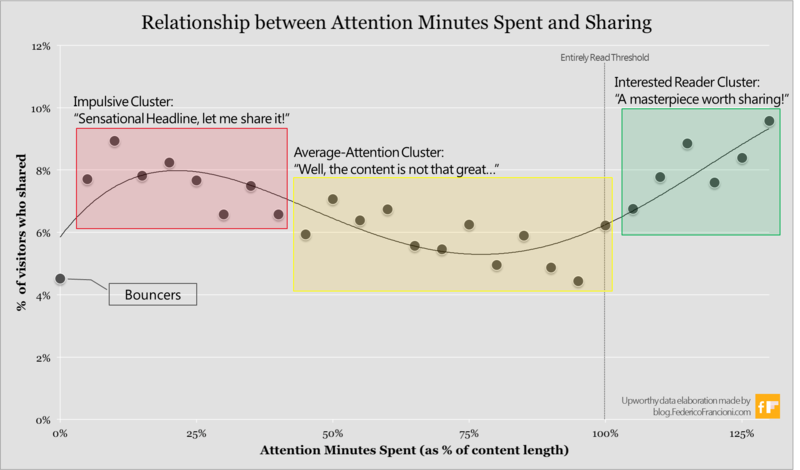 Attention minutes is a fine-grained, conservative measure of how long people are engaging with the content on web pages. 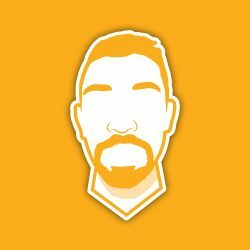 Total Attention on Site (per hour, day, week, month, whatever) — that tells us (like total uniques or total pageviews) how good of a job Upworthy is doing overall at drawing attention to important topics. And Total Attention per Piece, which is a combination of how many people watch something on Upworthy and how much of it they actually watch. Pieces with higher Total Attention should be promoted more. Its implementation is far more precise than “Time on Page” as it’s usually measured. Time on Page generally relies on a very sparse set of signals to figure out whether viewers are still paying attention. And especially on the last page of a visit, it can be hugely misleading (Here’s a handy explainer about why that is). Attention minutes are built to look at a wide range of signals — everything from video player signals about whether a video is currently playing, to a user’s mouse movements, to which browser tab is currently open — to determine whether the user is still engaged. The result is a fine-grained and unforgiving metric that tells us whether people are really engaged with content or whether they’ve moved on to the next thing. As pageviews have begun to fail, brands and publishers have embraced social shares such as Facebook likes or Twitter retweets as a new currency. Social sharing is public and suggests that someone has not only read the content but is actively recommending it to other people. There’s a whole industry dedicated to promoting the social share as the sine qua non of analytics. Caring about social sharing makes sense. You’re likely to get more traffic if you share something socially than if you did nothing at all: the more Facebook “likes” a story gets, the more people it reaches within Facebook and the greater the overall traffic. The same is true of Twitter, though Twitter drives less traffic to most sites. But the people who share content are a small fraction of the people who visit that content. “I think there’s a group of publishers who say, ‘Look, we’re web native, we can do a lot more to get a realistic picture of what’s going on on the web than we ever could in the analog world,’ ” Upworthy’s director of business intelligence Daniel Mintz tells The Verge. Upworthy’s critics say it maximizes for social media shares, “sending a (false) message to Facebook that those headlines are the stories its users really want to read,” as Reuters columnist Felix Salmon put it. But the company’s new emphasis on the time spent on a story contradicts that claim, suggesting that Upworthy is playing a longer game. While the number of times a story is shared may not be a perfect signal of quality, it’s reassuring to know that stories that hold a reader’s attention all the way to the end are also rewarded by the Twittersphere. Bottom line, measuring page views, and social sharing is great for understanding volume, but if you’re using that to understand which content is capturing more of someone’s attention, you’re going beyond the data. Social is not the silver bullet of the Attention Web. Looks like Facebook is taking a step towards the “Attention Social” too, as they announced yesterday that they are updating the social feed algorithm to reduce click-baiting headlines. Media companies, desperate for new revenue streams are turning to Native Advertising in droves. Brands create or commission their own content and place it on a site like the New York Times or Forbes to access their audience and capture their attention. Brands want their message relayed to customers in a way that does not interrupt but adds to the experience. However, the truth is that while the emperor that is native advertising might not be naked, he’s almost certainly only wearing a thong. On a typical article two-thirds of people exhibit more than 15 seconds of engagement, on native ad content that plummets to around one-third. 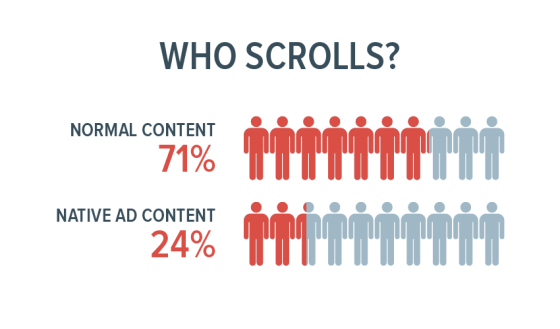 You see the same story when looking at page-scrolling behavior. On the native ad content analyzed by Chartbeat, only 24% of visitors scrolled down the page at all, compared with 71% for normal content. If they do stick around and scroll down the page, fewer than one-third of those people will read beyond the first one-third of the article. What this suggests is that brands are paying for — and publishers are driving traffic to — content that does not capture the attention of its visitors or achieve the goals of its creators. Simply put, native advertising has an attention deficit disorder. The story isn’t all bad. 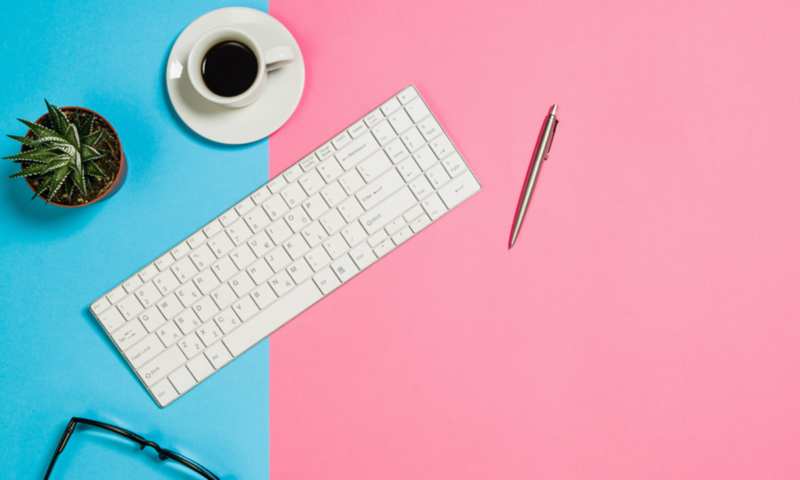 Some sites like Gizmodo and Refinery29 optimize for attention and have worked hard to ensure that their native advertising experience is consistent with what visitors come to their site for. They have seen their native advertising perform as well as their normal content as a result. The lesson here is not that we should give up on native advertising. Done right, it can be a powerful way to communicate with a larger audience than will ever visit a brand’s homepage. 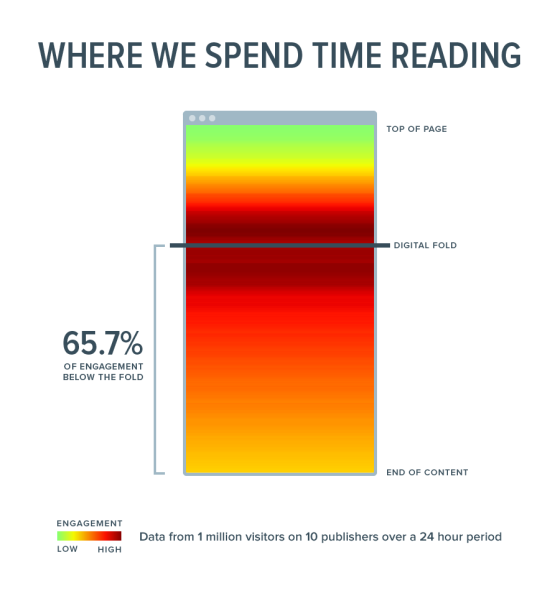 However, driving traffic to content that no one is reading is a waste of time and money. As more and more brands start to care about what happens after the click, there’s hope that native advertising can reach a level of quality that doesn’t require tricks or dissimulation; in fact, to survive it will have to. For the last few years there have been weekly laments complaining that the Banner Advertising is dead. Click-through rates are now averaging less than 0.1% and you’ll hear the words banner blindness thrown about with abandon. If you’re a direct response marketer trying to drive clicks back to your site then yes, the banner ad is giving you less of what you want with each passing year. However, for brand advertisers rumors of the banner ad’s demise may be greatly exaggerated. It turns out that if your goals are the traditional brand advertising goals of communicating your message to your audience then yes, most banner ads are bad…. but…. some banner ads are great! The challenge of the click web is that we haven’t been able to tell them apart. Research has consistently shown the importance of great ad creative in getting a visitor to see and remember a brand. What’s less well known is the scientific consensus based on studies by Microsoft [pdf], Google, Yahoo and Chartbeat that a second key factor is the amount of time a visitor spend actively looking at the page when the ad is in view. Someone looking at the page for 20 seconds while an ad is there is 20-30% more likely to recall that ad afterwards. So, for banner ads to be effective the answer is simple. You have to create great creative and then get it in front of a person’s face for a long enough period for them to truly see it. The challenge for banner ads is that traditional advertising heuristics about what works have been placing ads on the parts of the page that capture the least attention, not the most. For quality publishers, valuing ads not simply on clicks but on the time and attention they accrue might just be the lifeline they’ve been looking for. Time is a rare scarce resource on the web and we spend more of our time with good content than with bad. Valuing advertising on time and attention means that publishers of great content can charge more for their ads than those who create link bait. If the amount of money you can charge is directly correlated with the quality of content on the page, then media sites are financially incentivized to create better quality content. In the seeds of the Attention Web we might finally have found a sustainable business model for quality on the web. This move to the Attention Web may sound like a collection of small signals and changes, but it has the potential to transform the web. It’s not just the publishers of quality content who win in the Attention Web, it’s all of us. When sites are built to capture attention, any friction, any bad design or eye-roll-inducing advertorials that might cause a visitor to spend a second less on the site is bad for business. That means better design and a better experience for everyone. A web where quality makes money and great design is rewarded? That’s something worth paying attention to.